Since I posted last week about a recent wine tasting with my girlfriends, today’s “Things I love Thursday” is about my new favorite summer wine. You need to know – if you don’t already – that I’m a red wine gal. I drink it winter, spring, summer and fall; I drink it with beef & bass, chicken & cheese. The one change I do make in the summer is that I look for a lighter red to sip on, one that is not as full, deep or heavy as one I’d choose to drink alongside a premium piece of red meat. Early this summer I found the perfect one, and this has been my “go to” selection ever since – Red Velvet by Cupcake. The wine is a delicious blend of 47% Zinfandel, 29% Merlot, 19% Cabernet Sauvignon and 5% Petite Sirah grapes. It is light, smooth – yes, velvety – a softer blend with an ever so slightly sweet finish. Its flavors are both floral and fruity – but think blueberries & strawberries rather than plums or raspberries. It has been a perfect during the hotter months as a stand alone glass or for pairing with appetizers or lighter summer fair – grilled chicken, boiled shrimp or burgers. Probably best of all, this $12 wine has been on sale for $8 at Kroger all summer long. Red Velvet by Cupcake – this is another thing I love. Note: For several years now, I’ve been in the habit of chilling my red wine. Once poured, it comes up to the perfect temperature after a little bit of breathing. HI! 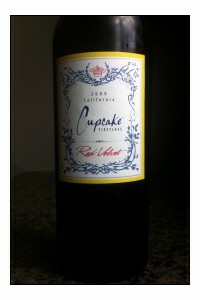 I just popped the cork on the Cupcake Red Velvet to have with our dinner tonight. I tried it, and it’s delicious! We are red wine people, too. In the summer, I usually end up making sangria, just to have a cooler red alternative. The Cupcake is perfectly light for summer. Thanks for the recommendation! Keri, glad you like it! I hope it inspires something wonderful! You get a good song out that bottle, let me know. Glad you’re enjoying it. I will certainly let you know!! Cindy – I just sent the link to Cupcake for their Blog Buzz. Thanks for the tip!